Whimsybop: A year of new beginnings! A year of new beginnings! The weather is getting cooler, the days are getting shorter and the woodsy scent in the air tells me that summer is drawing to a close and autumn days are near. For the past two weeks I've been waking up (Monday through Friday) to the voices of children talking on the sidewalk in front of our house on their way to the school down the street and to the sounds of the yellow school buses carrying precious cargo. Yes, school is back in session and those lazy days of summer are now a memory and the familiar comfort of routine is back in full swing. Parents have earned their back-to-school badges as once again we have managed to successfully outfit our children in fresh underwear, fashionable shoes and trendy clothing that will surely earn them a seat with the popular kids in the cafeteria (or so the advertisements tell us). Go ahead Mom, you are now free to enjoy the Sunday newspaper again without studying the sales ads or clipping coupons...at least until November when we get to do it again while wearing a Santa hat on our heads. New beginnings are upon us all and the Foster's are no exception. Our daughter is now a freshman in college (oh, the emotion in that!). Our son just began a demanding two year community college program as a high school junior. I have begun an adventure of my own too - just a few days ago I opened a shop on Etsy: "DoodleAllDaydesigns" in hopes of selling my artwork, (http://www.etsy.com/shop/DoodleAllDaydesigns) - wish me luck! 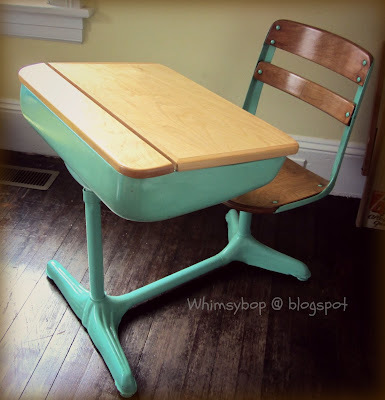 Next week Whimsybop will start where we left off and showcase collecting again - but until then, I thought I'd have a little "Show and Tell" fun and show you my little school desk. I purchased this little cutie nineteen years ago while antiquing in southern California with a few girlfriends. Of course it wasn't nearly this adorable at the time - my husband stripped it down to bare metal and painted it with the same shade of paint that my '69 VW bug had been painted months earlier. He also put a new wood top on it since the old desk top was in pretty rough shape. When I bought it I was pregnant with our daughter, who used it during her homeschooling years - such wonderful and precious memories of school days! I'm a firm believer that we should always be learning and growing no matter what our age - so tell me, now that school's in session, what's YOUR new adventure this year? That's right Elena - YOU were one of the girlfriends along with Selina and Kathy that day, (if I remember correctly). I remember shoving the desk into the back of Kathy's hatchback, hoping that it would fit without breaking the car window! Have fun homeschooling Mary - those elementary years were the absolute BEST! The desk is beautiful. DC does a really nice job. Did you have the desk when I visited you guys in CA in '93? I remember your bug was being spiffed up & we went to pick it up. Anyway, homeschooling was fun at times wasn't it? Hey Mocha Momma! Not sure if we had the desk when you visited us in CA - and yes, DC did a FANTASTIC job! :) Thanks for stopping by! Wow, you have a great collection! My dad had a black lunch box just like that when I was a kid.